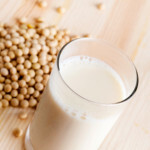 Soy foods are products such as soy milk, cheese, yogurt, tofu, ice cream, and other foods that are made from soybeans. Soy foods have recently become more popular in the United States, although people in Asia have eaten soybeans for hundreds of years. Soy is rich in protein, vitamins, and minerals such as iron and calcium. Soy contains heart-healthy fat and is also low in saturated fat. Where can I find soy foods? Green soybeans (“edamame”) Fresh soybeans can be eaten as snack or meal after steaming or boiling them in lightly salted water for 15-20 minutes. Hydrolyzed vegetable protein Hydrolyzed vegetable protein is made from soybeans and other vegetables. It can be added to soups or casseroles to add protein and flavor. Miso Miso is a paste made from soybeans, grain, and salt. Miso can be used to make soup or sauces. Soy cheese Soy cheese is made from soy milk and can be used as a substitute for dairy-based sour cream, cream cheese, or cheese. Soy flour Soy flour is made from ground roasted soybeans. Soy flour can be added to baked goods to add protein. However, soy flour cannot be used as a complete substitution of all flour in a recipe because it doesn’t contain gluten, which is a protein that helps dough rise, and it will not produce the same texture in baked goods. As a general rule of thumb, soy flour can be substituted for up to 1/3 cup of regular flour. Soymilk Soymilk is made from soybeans that have been soaked in water, ground, and strained. Fortified soy milk (which has added calcium and vitamin D) can be used instead of dairy milk as a drink, in cereals, and in other recipes. Soy milk comes plain and in different flavors such as chocolate and vanilla. It is a good alternative to milk for someone with lactose intolerance or milk protein allergy as it is comparable in protein and calcium content. Soy nut butter Soy nut butter is made from roasted whole soy nuts, which are crushed and blended with soy oil. The butter can be used in place of peanut butter and is a good substitute for people who are allergic to nuts. Tempeh Tempeh is made fermented soybeans and grain. Tempeh can be marinated and grilled and added to soups, casseroles, or chili. Tofu Tofu is made by curdling fresh, hot soy milk. Firm tofu can be used in soups, stir-fries, and casseroles. It can be baked or grilled and will take on the flavor of a sauce or seasoning. Silken tofu can be used for dips and dressings. What are some easy ways to eat soy? Stir-fry the mixed vegetables, garlic, and ginger in canola oil until tender. Add the cubed tofu and onion and cook until warm. Add soy sauce to taste. Serve over rice and enjoy. Add tofu to the remaining water and turn the heat down to medium. Cover the pot and cook for 1 to 2 minutes. Add spinach and bok choy and cook on low for about 1 to 2 minutes, or until the greens are tender. With the hot water you set aside, blend in the white miso and barley miso. Add the blended mixture to the soup. Add scallion and serve.